Oregon landlords, is your tenant behind in the rent? Serve the tenant with this 3 Day Notice of Demand for Unpaid Rent. The Notice informs the tenant that he/she must pay the overdue rent within 3 days. If the rent is not paid within the time allotted, the landlord will initiate legal proceedings to recover the property. 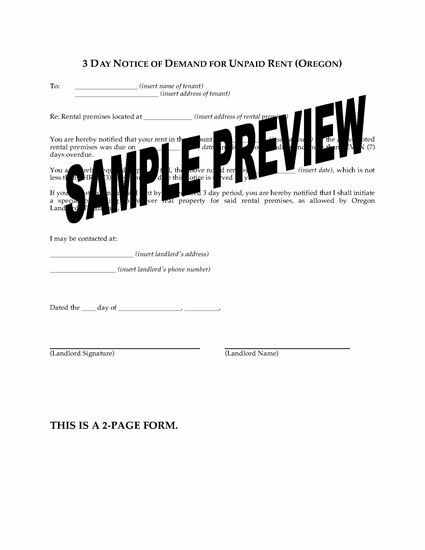 A Service of Notice form is included to record the details of how the Notice was served on the tenant. This Oregon 3 Day Notice of Demand for Unpaid Rent form is provided in MS Word format, and is easy to use - just download, fill in and print.